Sol. The Clearing Corporation of India Ltd. (CCIL) was set up in April, 2001 to provide guaranteed clearing and settlement functions for transactions in Money, G-Secs, Foreign Exchange and Derivative markets. Q5. Which of the following is the mode of settlement of securities where in the transfer of securities and funds happen simultaneously? Sol. Delivery versus Payment (DvP) is the mode of settlement of securities where in the transfer of securities and funds happen simultaneously. This ensures that unless the funds are paid, the securities are not delivered and vice versa. DvP settlement eliminates the settlement risk in transactions. Q6. Which among the following banks has launched a Multi-currency Forex Card for overseas travelers recently? Sol. Standard Chartered Bank has launched a Multi-currency Forex Card for overseas travelers. The card will allow customers the convenience of loading up to 20 widely used currencies on one card with an online reload facility during overseas travel. Q7. SIDBI has started full-fledged merchant banking operations to benefit the expanding number of growth-oriented MSMEs, especially those with a strong technology and innovation quotient. What is the meaning of "D" in SIDBI? Q9. Reserve Bank of India (RBI) has set up Supervisory Colleges for six Scheduled Commercial Banks which have sizeable international presence recently. Which among the following Banks is not them? Sol. 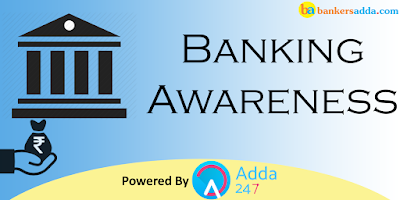 Reserve Bank of India (RBI) has set up Supervisory Colleges for six Scheduled Commercial Banks which have sizeable international presence: - State Bank of India, ICICI Bank Ltd., Bank of India, Bank of Baroda, Axis Bank Ltd. and Punjab National Bank. Q10. Which Bank and Bajaj Allianz General Insurance have signed an agreement for the distribution of insurance products through the branches? Q11. Which among the following sectors contributes most to the saving in India? Sol. Household contributes most to the saving in India. Sol. Established by the Government of India, EXIM Bank has commenced operations in 1982 under the Export-Import Bank of India Act, 1981 as a purveyor of export credit, mirroring global Export Credit Agencies. Sol. NPA stands for Non-Performing Asset. Q14. Which of the following schemes has been launched for providing health services in rural areas? Sol. The ASHA or the Accredited Social Health Activist. ASHA will be the first port of call for any health related demands to access health services. ASHA will be a health activist in the community who will create awareness on health and its social determinants and mobilize the community towards local health planning and increased utilization and accountability of the existing health services in Rural areas. Q15. Which of the following is NOT a banking related term? Sol. In physics, radiation is the emission or transmission of energy in the form of waves or particles through space or through a material medium.